What could be the link between art exhibitions and club parties? From the White Cube in art galleries to Black Boxes in clubs, from art curators to DJs, the worlds intersect without being too close. 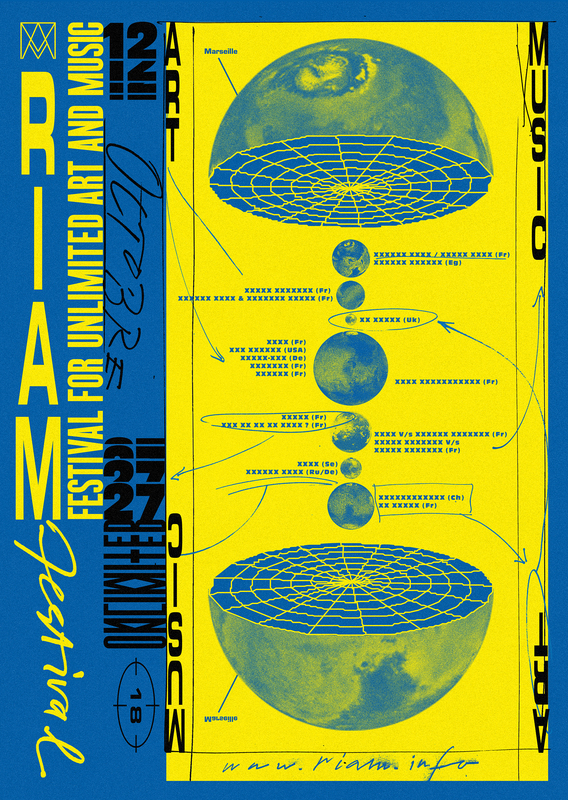 RIAM Festival suggest for each edition a combination of art forms and media in the scope of opening up the creative practices out of their comfort zone. This fifteenth edition makes no exception and blurs the tracks. More than a festival program with a common line-up, often in an imposed lapse of time, RIAM Festival would rather focus on downtimes, dialogues, meetings and collaborations to shed some light on some specific artistic approach. As with the poster graphic, the festival invites artists, theorists and musicians to share a specific vision of the world as it is for an exhibition time, talks, live or dj-set. See you in Marseille from 12nd to 27th October for these trips around worlds.